In the political economy literature as applied to development, there is a tendency to view democracy in onedimensional terms. In this essay we move away from this one-dimensional characterization. This broadening of the concept leads to a re-examination of the literature on the relation between long-term growth or development and democracy. With these two steps accomplished it becomes feasible to identify the main potential paths that the Cuban economy can follow in terms of recent research on social orders. Furthermore, it also becomes feasible to identify the impact of the financial crisis and its aftermath on important features of these social orders. In the first section we present basic arguments on the existence of several different dimensions on which to evaluate governments in general and democracies in particular. In the second section, we provide a brief review and re-interpretation of empirical evidence on the relationship between growth and democracy in light of these different dimensions. 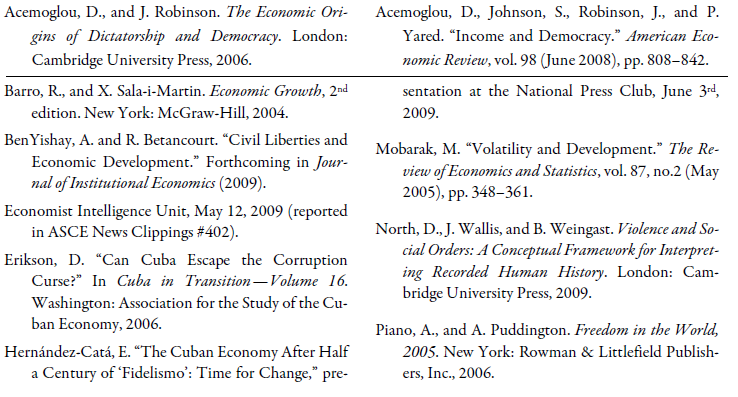 We use these ideas and recent work on the nature of social orders to suggest three potential development paths for Cuba’s economy in the third section. Finally, in the last section we draw implications of the financial crisis and its aftermath for these potential development paths. Most individuals think of free and fair elections as an essential characteristic of democracy. It provides a well known, reliable and non-violent mechanism for the inter- temporal transmission of power. The free and fair elections aspect of democracy is usually viewed in terms of freedom from intimidation and coercion in the exercise of the vote as well as an environment to participate for candidates and parties that is open to competition. Nevertheless, there is an economic dimension to free and fair elections that is often ignored in popular discussions of the subject. This economic dimension is relevant for citizens as voters, politicians as candidates and parties as organizations as well as members of society at large as taxpayers and recipients of private and public goods. For instance, there are some economic costs for citizens voting in elections and the costs often seem to outweigh the benefits for any given individual. This feature has led to a substantial academic literature in economics and politics trying to rationalize why citizens vote on a voluntary basis. It is often referred to as the paradox of voting. Along the same lines, there are also substantial economic costs to the politicians and parties that participate in the elections. These range from opportunity costs of income foregone during campaigns to the direct costs of participating in terms of travel, advertising or more generally providing information about candidates and policies and salaries of associates. In this case, however, the economic benefits can be substantial for those elected and participation is not framed in terms of paradoxes. Finally, there are also costs to society in terms of organizing the elections and ensuring that they are free and fair in terms of registering voters and parties, supervising and implementing the process, etc. Indeed, developing an electoral system from scratch can be quite costly in terms of time and money. For instance, a committee of lawyers associated with the American Bar Association has estimated that it would take at least two years after a regime change in Cuba before free and fair elections could be organized. The economic benefits would arise in terms of the contributions to the provision of private and public goods in society generated by the policies of the politicians chosen by the free and fair election system. The protection of individual rights is a second dimension of democracy that is widely recognized as an essential characteristic. Indeed, first generation human rights such as freedom of expression and assembly have been recognized as essential characteristics of democracy over the last two hundred years by having them embedded in most countries’ constitutions. Second generation human rights, for example secure ownership rights and individual mobility (in the pursuit of economic betterment with respect to location, education and employment), are of more recent vintage. Nonetheless, they have been viewed over the last several decades as part of the array of civil liberties to be provided and protected by a democratic government; for example Freedom House includes them as part of their civil liberties index. Just as in the case of free and fair elections, however, there are economic benefits and costs in the provision of these civil liberties. Some costs are shared with the provision of free and fair elections: for example an independent judiciary for the adjudication of disputes is required by both dimensions. Other costs can be specific to the protection of some of these rights, for example land registries and title certifications. The economic benefits of second generation rights are very direct in that output tends to increase as a result of the lower uncertainty and transaction costs as well as of the improvements in resource allocation. Yet, even the first generation ones—for example freedom of speech and assembly—have indirect economic benefits in terms of facilitating the generation and distribution of knowledge that underlies modern economic growth. Life gets complicated, however, when we come to a third dimension of democracy as a form of government, namely legitimacy. While political scientists take this concept for granted, most economists do not seem to know what to do with it and consequently it is most often ignored even in the area of political economy. By legitimacy I mean the willingness of the governed to accept the right of those who govern them to do so. Just as most features of institutions, legitimacy has a formal and an informal component. For instance, in a democracy the formal or de jure aspect is acquired by attaining power through some form of electoral process. The informal or de facto aspect, however, is attained through the level of performance of governmental functions by those elected, given the standards of the society at particular historical times. Incidentally, the legitimacy dimension is relevant to all forms of governments, not just to democracy. But the same applies to the previous two dimensions. All forms of government have to address the inter-temporal transmission of power, the level and type of individual liberties to provide and guarantee, and the attainment of de jure and de facto legitimacy by those who govern. Different forms of government, however, are associated with different mechanisms for addressing these three functions and/or with providing different levels of accomplishment on these three dimensions. Once legitimacy is brought into the picture, it also becomes clear that these three dimensions are not necessarily independent from the point of view of the members of society. For instance, many Singaporeans view as legitimate limitations on civil liberties (for example freedom of assembly) and the limited competitiveness of their elections. This is due, at least in part, to the de facto legitimacy conferred upon their system by the superior economic growth performance of their economy since 1959 and the government’s intelligent use of the resources generated to provide substantial benefits to the population at large. Similarly, a number of Cubans and Venezuelans view as legitimate the far more severe limitations their forms of government impose on the competitiveness of political participation by opposition candidates and on the first and second generation human rights of their citizens. In these two cases whatever levels of de facto legitimacy one perceives would be related to factors such as real or perceived affronts to national identities, the pervasive corruption of previous democratic forms of governments, and the provision of substantial economic benefits to the poor at least in the short-run. In any event, the previous examples illustrate the interdependence between legitimacy, the inter-temporal transmission of power, and civil liberties through their economic aspects. It is more insightful for our immediate purposes, however, to consider the implications of this multidimensional view of a state’s basic functions in two dimensions. While we acknowledge legitimacy as an important dimension of any form of government, including democracy, it has not featured in the empirical literature on democracy and economic growth. Hence, we follow this tradition and focus on free and fair elections as well as on civil liberties as the two relevant dimensions while reviewing this literature in the next section. Given the multidimensional nature of democracy as a system of government indicated above, it is interesting that the empirical literature on economic growth and democracy focuses on only one of these dimensions: the electoral process dimension. The clearest statement is in the book by Acemoglou and Robinson (2006). In their Chapter 3 (What do we know about democracy), they quote approvingly the following definition of democracy by Schumpeter: “…the institutional arrangement for arriving at political decisions in which individuals acquire the power to decide by means of a competitive struggle for the people’s vote.” In discussing the measurement of democracy, they suggest as their main measure the Freedom House political rights index.2 The latter is an aggregation of three subcategories of political rights: (1) the freedom and fairness of the electoral process; (2) the political pluralism and competitiveness of participation in the political process by individuals and groups; and (3) and the effectiveness of governance with respect to influence of elected representatives on policies, degree of corruption and degree of accountability and transparency.3 They also use as a secondary measure a composite Polity variable that captures the competitiveness of political participation and executive recruitments as well as constraints on the executive. More recent work by Acemoglou, Johnson, Robinson and Yared (2008) also relies on this secondary measure and for the same reason: it goes back well into the 19th century. One conclusion from this empirical literature is that democracy, measured with the above indexes, does not explain the average rate of economic growth empirically. Without correcting for simultaneity, as in Barro and Sala-i-Martin (2004), it does not do so because the statistically significant correlations that are found are not robust to the addition of other explanatory variables or changes in samples of countries. When correcting for simultaneity or endogeneity, as in Mobarak (2005) or Acemoglou, Johnson, Robinson and Yared (2008), it does not do so because the correction eliminates statistically significant results found without the correction. BenYishay and Betancourt (2009) consider the role of civil liberties in explaining long-term economic growth or development. They use four disaggregated subcategories of the Freedom House civil liberties index for this purpose. They find that second generation human rights, measured by the subcategory Personal Autonomy and Individual Rights, play a far more powerful and robust role than any of its competitors in explaining development. Among the latter are first generation human rights, the Freedom House political rights index, any of its components, The Fraser Institute Economic Freedom Index, any of its components, or the Polity variable Constraints on the Executive. On the basis of these results, the electoral process and the civil liberties process dimensions of democracy yield different implications for the alternative development paths that the Cuban economy can follow. The free and fair elections dimension does not bear a positive, robust relationship to long-term economic growth, but the protection of second generation human rights bears such a positive robust relationship. The latter provides the best indicator of a government’s commitment to the provision of secure property rights broadly defined. Since the economic ones associated with this subcategory are those one would expect to have the greatest direct impact on growth, it is not surprising that they dominate political rights variables as well as first generation human rights in exhibiting a positive impact on economic growth. In their recent book North, Wallis and Weingast (2009) emphasize the role of violence in determining social orders and the role of social orders as mechanisms for controlling violence. Social orders are characterized by them as limited access and open access in both the political/legal and the economic sphere. They go on to argue that true democracies are characterized by open access in both the political/legal and the economic sphere. A critical difference between limited access orders and open access orders is the degree of free entry and competition into the political/legal and economic realm. While the authors leave measurement issues with respect to these ideas as a task for future research, they provide extensive discussions on the nature of the processes involved in moving from limited to open access orders in both realms. Thus, their concepts become useful for identifying the main alternative paths of development available to any economy, including the Cuban economy. Chávez and his entourage in Venezuela provide an interesting example of this variant. For, they are trying to become a more limited access social order in both the economic and the political/legal realms. This is accomplished in the latter realm by depriving recently-elected officials from other parties of the ability to implement the policies that they were elected to undertake with false accusations or by depriving them illegally of the resources to implement policies. As a result, one of these elected officials felt compelled to ask for political asylum in Peru, which he received. In the former realm, restriction of entry is accomplished by using control of the government to limit or eliminate competition in various economic sectors. Cuba has an extreme version of this variant currently. Those elites in control of the government, namely high ranking members of the Communist party and the military as well as the Castro’s family inner circle, have an iron grip on the political realm and substantial control in the economic realm through the Sociedades Anónimas and state control of most of the economy. Indeed, the extent of competition and free entry that needs to be possible in both realms for Cuba to be viewed as an open access system is greater than for most other countries in the world. Even Robert Mugabe’s kleptocracy in Zimbabwe seems to have more competition and entry in both realms and certainly in the political one. One basic alternative for the future in Cuba’s case is to maintain the limits on access in both the economic and the political realms. Variants of this alternative in the future would be small openings of access in both realms while preventing large degrees of openings in either realm. The feasibility of this variant is likely to be tied to oil availability, either in the form of subsidies from Venezuela or other countries or through exploitation of the deep sea oil fields recently discovered. The next possible path that can be followed is what one may call the “Chinese Variant.” This would be a limited access social order in which there would be considerable free entry and competition in the economic realm, but no free entry or very limited competition in the political realm. China and Vietnam are extreme examples of this variant, but one can argue that Singapore also falls in this category in that its citizens enjoy far more freedom and possibilities of competition and free entry in the economic realm than they do in the political realm. For instance, in 2006 Freedom House gives Singapore scores of 4 and 6 out of 12 and 16, respectively, in two dimensions of the political realm: the holding of free and fair elections and political participation and pluralism. Meanwhile, the country scores 12 out of 16 in the main dimension of the economic realm: the individual rights and personal autonomy category that reflects, for example, security of ownership rights and freedom of mobility for economic activities. Some of the Cuban elites in power today may view this variant as an attractive alternative. For, it would allow them to increase the size of the total rents available even if it meant having to share them with a wider set of participants. The particular nature of this variant to be pursued would depend on: the perceptions of political risk due to an economic opening; the gains perceived to be made possible by the economic opening; and the opportunity cost of the current alternative variant in which they find themselves. One opportunity cost of this variant, for example, is the erosion of the rents presently enjoyed by those elites in the party and the military that control the Sociedades Anónimas. On the other hand, a lack of access to oil, for whatever reason, increases the attractiveness of the Chinese variant for current elites as an alternative source of rents. Last but not least among these alternative paths for the future is what one may call the “Democratic Variant.” In the terminology developed here, this implies an open access social order, which requires open access in both the political/legal realm and the economic realm. The possibility of free entry and competition in the political realm requires more than just the holding of free and fair elections. For instance, if it is very costly to organize politically and only one major party can participate in an election, the competition aspect in the political realm is not met and such a system is not a democratic variant or an open access social order in the terminology adopted here. More generally, the ability to create perpetually lived organizations in the legal framework of a society is viewed as a necessary (but not sufficient) condition for its classification as a democratic variant or an open access social order in both realms. This privilege or ability, however, must be extended to all members of society. That is, it must be based on impersonal exchange not on elite identification. Clearly this is the path for the Cuban economy that most people living in the United States would prefer and perhaps most of those living in Cuba as well. What is not clear is what would be the process that would take the Cuban economy from its current Russian- Variant limited access social order to a Democratic variant open access social order. In their discussion of possible transition processes between natural states and open access social orders, North, Wallis and Weingast (2009) suggest three “door step conditions.” That is, before a natural state can evolve into an open access social order it must satisfy these conditions. The latter are: (1) the establishment of a “Rule of Law” for the elites; (2) the establishment of perpetually lived forms of private and public organization for the elites, including the state itself; and (3) the establishment of consolidated political control of the military. They view a transition taking place as a result of extending these forms of impersonal exchange relationships between some elites to all other members of society. While Cuba is not close to satisfying any of these three conditions at the present time, it is interesting that one of the demands of some dissident groups is that the Cuban government live up to abiding by many of its own legal rules. If they were to succeed, it would lead to this particular natural state moving closer to a transition in extending some aspects of the “Rule of Law” to all citizens. One important consequence of the global financial crisis for Cuba is that the resulting drop in economic activity worldwide has had negative effects on foreign exchange availability. For instance, nickel prices have fallen almost 50% from an average of $21,000 per ton in 2008 to an average of $11,000 per ton in the first quarter of 2009. Tourism revenues have also declined substantially despite an increase in arrivals in the first quarter of 2009. Not surprisingly, the Economist Intelligence Unit (EIU) reports new regulations limiting foreign exchange transactions by foreign firms and associations that they attribute to restricted foreign exchange availability. On the tourism front, EIU reports decreases in the rate of growth of arrivals starting in January 2009 and a substantial decline in March. They provide an ambiguous forecast for arrivals during the rest of the year. On the negative side is a continuation of the decrease in arrivals, especially from their main two sources (Canada and the UK); on the positive side is Cuba’s ability to capture tourists through an extension of the relaxing of travel by Cuban-Americans to other U.S. citizens. These new circumstances have manifested themselves in frequent references by Cuban officials to a new economic situation. One of the most salient ones was a recent comment by the President of the Central Bank. In arguing that Cubans need to save more, he proposed a new slogan for the Revolution. Instead of using the well-known fifty-year-old one “Fatherland or Death,” his proposed new one is the far more prosaic and bourgeois-sounding “Save or Die”! Another important consequence of the financial crisis is that the availability of subsidies from Chávez of Venezuela is also thrown into question. With the price of oil falling by more than 50% since the Fall of 2008, the continuation of subsidies at the same rate as before is unlikely. In addition a former PDVSA official recently argued that Venezuela’s oil production is declining and that even some of the oil contracted to reach Cuba fails to do so due to corruption by Venezuelan officials. With respect to the subsidies through oil, these new circumstances have manifested themselves in Cuba by a wide variety of official appeals to save on the consumption of electricity. There are indications that circumstances worsened this summer. For instance, the expression of concerns about possible chaotic conditions by a dissident as prominent and well informed as Oscar Espinosa Chepe at the summer 2009 ASCE meetings. Citizens have been urged by high level functionaries “to get real” about energy savings in light of the new scarcities. The latter have resulted in power outages (“apagones”) reminiscent of the Special Period (1990–1993). In a recent presentation, Hernández-Catá (2009) has argued for unification of the currency and the exchange rate. In response to a commentator he has suggested its feasibility in terms of a Chinese variant for Cuba. Unfortunately moving to a Chinese variant from the current Russian one is perceived as politically risky by the Cuban authorities. Some may believe that this perception of risk is based on the possible negative effects on the poor in the short-run. The analysis here suggests that a more likely reason for the perception of risk is that it undermines the rents currently being enjoyed by the small elites benefiting from the current Russian variant. Not all of the consequences of the financial crisis are inimical to the interests of the current regime in terms of staying in power without major reforms. For instance, the resulting profound discredit of the capitalist system among the citizens of many countries is easy to use for the delay or abandonment of reforms that would open or increase access in both the political/legal and the economic realms. This is true regardless of whether or not this discredit or criticism is deserved. For, regardless of the merits of the criticism, the overall perception it generates helps prevent changes that facilitate the emergence of an open access social order. For instance, in the economic realm it provides an additional rationale for debt forgiveness and a continuation of Cuba’s penchant for ignoring economic constraints. Cuba’s credit at the international level has been almost non-existent in regular “impersonal” international credit markets as a result of not paying many of its international debts since 1986. With the advent of the financial crisis, Cuba has enough company from other more “respectable” debtors to dilute the distinction between voluntary and involuntary repudiations, at least in some margins. The new IMF “architecture” in response to this crisis puts much less pressure on domestic reform in exchange for loans. This novel approach makes it harder politically to treat Cuba differently and to require specific reforms in exchange for loans. Even when there is wide agreement among economists that specific reforms are welfare improving, it becomes more difficult to argue in favor of requiring or imposing them. Similarly, in the political/legal realm the financial crisis has facilitated what some called—prior to Obama’s meetings with the Latin American foreign ministers— the end of the supremacy of economics and the beginning of the supremacy of politics. One manifestation of this new supremacy has been a concerted effort to have the U.S. accept Cuba into the Organization of American States (OAS) without any need to move toward, let alone meet, the minimal conditions for democracy embodied in the OAS own charter. This validates the current Cuban regime’s position of ignoring any move toward an open access system in the political/ legal realm. Interestingly, democratic governments, for example Chile and Brazil, have supported this effort. On the optimistic side, some have argued that these governments are simply putting ahead self-determination values over democratic ones; similarly, others have argued that they are merely lifting archaic sanctions imposed in 1962 when there was a Soviet Union. On the pessimistic side some have accused these governments of having no moral compass; others have accused them of pursuing Machiavellian power politics strategies designed to shut the United States out of influence in Latin America. Since Cuba is required to agree to abide by some democratic principles if it applies for OAS membership, these rationales will sort themselves out in the future should Cuba apply. An especially fascinating characteristic of crises is their ability to generate the unexpected. The stresses they create can undermine democratic governments or autocratic ones, but they can also leave basic systems in place. From this perspective, the impact of the current financial crisis on Cuba’s future raises hope of dramatic change. Given the totalitarian limited access system currently in place, it is not unreasonable to expect that the change would be in the direction of more open access systems in both the political/legal and economic realms. The probability of dramatic change in the direction of open access realms has certainly increased, perhaps as much as ten-fold as a result of the crisis. Unfortunately, this increase is more likely to be represented by a change in the probability of regime change that goes from 1 out of 10,000 to 1 out of a 1,000, and not from 1 out of 10 to 1 out of 1. If this low probability event materializes, however, it will represent the beginning of a long process towards an open access social order in the island. 1. I would like to thank Rolando Castañeda, the discussant, for his valuable comments during the presentation of an earlier version of this paper at the 2009 annual meetings of ASCE. A seminar on a related topic was given at the University of Maryland in September of 2009. Many insightful comments from the participants, especially Razvan Vlaicu, John Wallis and Victor Macías, helped improve this version. Any remaining errors are, of course, my responsibility. 2. For a detailed description of the Freedom House measures of political rights and civil liberties see, for example, Piano and Puddington (2006). 3. Barro and Sala-i-Martin (2004) in their textbook on economic growth also used this measure of democracy in their empirical analysis of growth determinants using a cross section of countries (Chapter 12). 4. In their terminology, the natural state label would also apply to the Chinese variant, to be discussed below. Yet, it is useful to differentiate between both variants of the natural state in the context of Cuba.